The governorship candidate and the senator representing Delta Central senatorial District at the National Assembly, Great Ogboru and Ovie Omo-Agege of the All Progressives Congress, APC, have said that the party will not be intimidated in the forthcoming elections by the PDP rigging tactics. 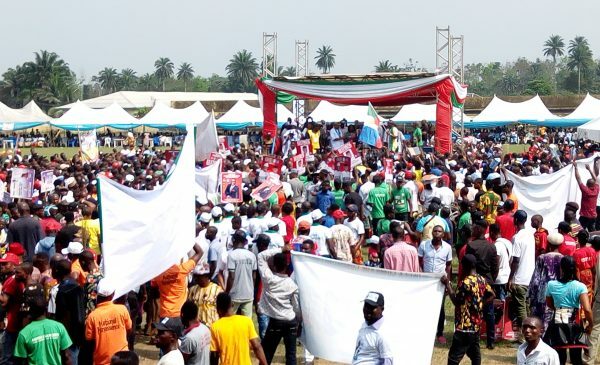 Speaking at the mainbow of Ughelli South stadium in Otu-Jeremi and Otor-Udu while on governorship campaigns they said, “Members of the APC and Deltans will resist any intimidation from the PDP because APC is poise to liberate Delta State from the hand of PDP monopolistic rule. According to Ogboru, ” The PDP is a party of darkness and it is only in APC Deltans can see light and development and he appealed to those who have sold the Permanent Voters Card to go and retrieve them back because votes will count in the coming elections. “Deltans should give the same support to President Muhammadu Buhari and the APC administration as they are supporting us because if he fails we fail. “Do not worry about Delta liberation because if you vote me and APC, Delta state will move forward”. “President Muhammadu Buhari has done well for the Urhobos and Deltans in general and the only way to pay him back is to vote for him for the second tenure. “Almost every road in Delta State are been constructed by the NDDC under Buhari administration and the APC”.